“Juuuuu-dy”, someone calls from across the street. I turn to look and a person comes running with big hugs and “Sain b’nu”, welcoming me back to my other home, Muren in Mongolia. It happens over and over again. Some people knew I was returning and some are surprised to see me. Either way, it is so good to see my friends again. Some things have changed. Muron has a new hotel and two new big stores looking very modern. One of the stores even has escalators to the second floor! What are we coming to? Most things are the same. Children give you a big smile and say “hi” when you pass them on the street. People already are asking me to teach them English. The outdoor market or zakh is busy as ever selling everything from food and clothes to used auto parts and household goods. There are currently four Peace Corps Volunteers in town and 2 in outlying soums or villages. Three will leave in the next few months and in August we will get a new batch. The present group has been very active in the school community—even had an American-style spelling bee last Saturday—all in English and the kids were amazing. The weather has been mixed. We expect snow on Tuesday but there are green shoots coming up here and there and trees are budding. After a week in Muron staying with my supervisor and her father, I have moved into my own home—where I lived before. Have to say I was a little spoiled because my supervisor lives in an apartment that is heated with a bathroom of sorts. Now I have to build my own fire—still chilly. And though I didn’t have to cook for myself I was ready for a change from mutton. One evening while I was still staying with Sarangeral (my supervisor) she made me a special concoction. Her father had purchased some special brown flour (not sure exactly what kind of flour) and she put some into a small bowl (what Mongolians call an ayuk–like a little Chinese rice bowl). She added some hot weak tea, some butter (or yellow oil as they call it here), and a couple of cubes of sugar. Then she stirred it and stirred it and continued adding flour until it was very thick. Then she gave it to me to eat. She explained that Mongolians have a tradition about this mixture. Long, long ago, it was thought that such a mixture would purify your insides and heal you of whatever ailed you. The secret ingredient though was that you wouldn’t use tea as the liquid. It would be your mother’s urine. In fact, the belief was that as long as your mother was alive and able to supply this special ingredient you would never die. After she died, you were on your own. Not sure how widely practiced it is today. Wednesday and were served traditional buuz and the trimmings by his wife. 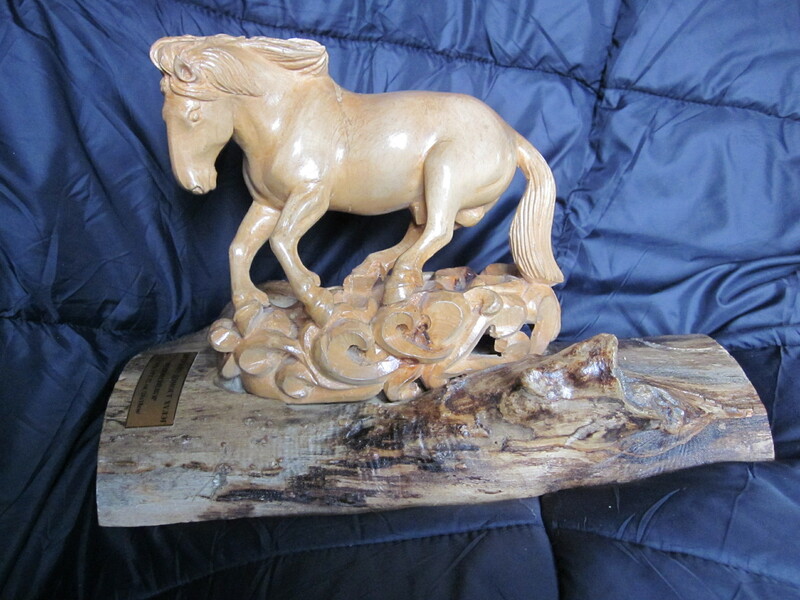 Before we left, he presented me with a beautiful carving of a horse (will include photo). I had asked Tracy to bring some carving tools to him when she came to Muron last September so perhaps this was a thank you. Today I was invited to visit my good friend Gaana whom I met shortly after I arrived in 2008. She is a “journalist” and works for the local TV station. I know her family well—husband, a little boy of 6 and girl of 4. She made mutton soup and we talked together (she speaks some English), and I played with her children. Her husband was watching television and fell asleep on their couch, then Gaana lay down on the couch and said she would rest for a few minutes and fell asleep. Then her son lay down with them and fell asleep. Meanwhile her little girl and I drew pictures together. It amused me and I’m just glad they felt comfortable enough with me to take a siesta. After Gaana awoke about half an hour later, I said I needed to go and said goodby. Maybe not your typical visit with friends in America, but it’s fine here in Mongolia. It’s good to be back.